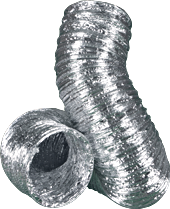 DryerFlex™ combines the ease-of-use and flexibility of foil flex with the fire resistance and airflow efficiency of semi-rigid transition duct. Easy to Handle and Always 4"
As workable as "slinky" foil. 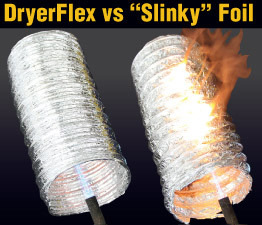 Flame resistant unlike "slinky" foil. Building code and appliance manufacturers require a UL2158A listing. 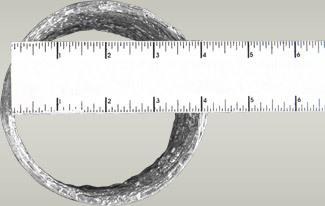 The dryer's transition hose can be an important factor in saving energy. It can also be a critical factor in protecting property and even lives. Why? Dryer-caused home fires have been documented at levels exceeding 14,000 a year. Flammable lint accumulates quickly in every exhaust system (even those that have the lint filter cleaned with every load). This can create a very real fire danger. What's going on behind the dryer? A big problem faced in laundry rooms is the crush point. Dryers naturally vibrate, or get pushed back against the wall. A transition hose that's not built strong (like every duct that was previously available before DryerFlex) can restrict airflow and actually increase the rate of lint accumulation. 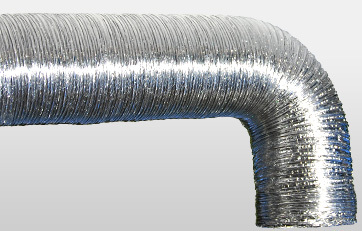 For safety reasons and added peace of mind, only UL2158A listed ducting, like DryerFlex, should be used to connect the dryer's exhaust system (non-listed hose such as that commonly used to vent bathroom fans should never be used). While building code and dryer manufacturers all require a UL 2158A listed transition duct, there are differences upon further testing. It is very common to find listed material that is fairly safe but does develop smoke and flame spread at lower temperatures. DryerFlex is the only flexible duct that has zero flame spread and zero smoke developed meaning it withstands fire exposure up to 482° with zero development of smoke or fire. Flexible white vinyl bathroom exhaust vent hose should never be used to connect a dryer. It is highly flammable, deteriorates over time from the heat, and it crushes easily.